PASADENA, Calif. (September 26, 2018) – Before the final round of interviews, the 44 finalists for the 2019 Royal Court took a group photo on the front steps of Tournament House. 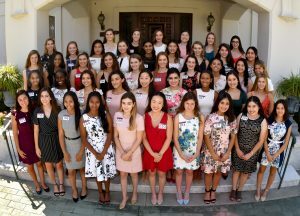 Applicants from 24 Pasadena area schools participated in the interview process and seven of the 44 finalists will be named to the 2019 Royal Court on October 1, 2018. The 2019 Royal Court will serve as ambassadors of the Tournament of Roses, the Pasadena community, and the greater Los Angeles area. Volunteer members of the Tournament of Roses’ Queen and Court Committee made its selections based on a number of criteria including public speaking ability, academic achievement, youth leadership, and community and school involvement.